Part 4: More treatments, more medical bills. But will these cure you? SF was diagnosed with cancer. She came to Penang to undergo the necessary treatment. Initially after chemotherpy, the tumours shrunk and the oncologist told her she was cured! But it was not true. The tumours grew back again after one month. SF was asked to go for radiation followed by more chemo. Then she has to go for surgery. That means more medical bills, but the big question remained unanswered: Can the treatments cure her cancer? She wanted a cure. Is cure possible? C: They asked you for go for 5 sessions of radiation and then chemotherapy. If the tumour shrinks they want to remove the tumour. In addition they want to remove your right kidney and the urinary tube. Okay, let me know – do you have any problem urinating now? If you cannot urinate, I see the need to operate immediately. But you look well and healthy. I also agree that if you get those tumours removed, the cancer will all be gone. But can surgery cure your cancer? C: What if I say that surgery will not cure your cancer? C: At CA Care we have the responsibility to advise patients who come to us. We are committed to give honest evaluation of your situation. We give advice without having an ulterior motive of wanting to sell our therapy. I have made a promise that I shall do my best to read and learn — to be knowledgeable. And I shall share that knowledge with those who need it without charging any fee, no matter how long I talk to them. Most important, I don’t want to mislead patients. But as much as we want to help, please also know that I am not god. I can only do my best. Go for medical treatments, you die. Follow our CA Care Therapy, you also die. What is your choice? C: Let me ask you one question, frankly and bluntly. If you go ahead and undergo the medical treatments as suggested by your doctors — i.e. radiation, chemo, surgery, etc. — for sure, you will have more medical bills to settle! And at the end of it all, there is no cure and you die. Are you satisfied with this route? P: No, I am not happy with that. C: I understand because even if you do all these treatments, no one can guarantee that you will be cured. There was one lady from Medan. She had breast cancer and underwent surgery, radiotherapy, chemotherapy, etc.. The treatment lasted 3 years but the cancer did not go away. She had to go into the ICU twice after her chemotherapy. She had to sell a piece of land to pay for her medical bills. During one visit to her oncologist she asked, Why is it, after 3 years already, you still cannot cure me? The oncologist replied, Ibu your cancer cannot be cured. This lady decided to give up chemotherapy and came to seek our help. It was too late, even her liver was “gone”! The daughter said, We felt cheated by all these. Yes, I understand. To me, I believe patients should be told well ahead of time the probable outcome of the treatment — even before embarking on any treatment. In this case, she was told the truth only at the very end of the game. Now, do you understand what I am trying to tell you? This brings me to another point. You come and see me. Can I cure you? My frank and blunt answer is, No, I cannot cure you. So if you take my herbs and follow my advice — after a month or two you feel healthy and well — can eat, can sleep, can move around but may have some pains here and there. Are you satisfied? Then one day you die. Are you ready to die without undergoing the medical treatments? Tell me, which path do you want to follow. P: Yes, I am prepared to take this path. Husband: Now that you have explained to us clearly, we understand. C: There is this man who came to see me. His father had lung cancer that had spread to his brain and was semi-conscious in the hospital. 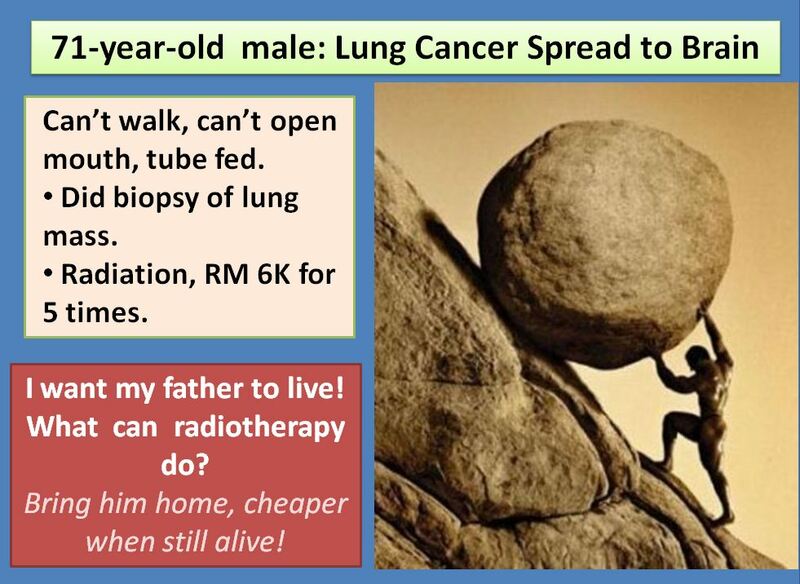 The doctors did a biopsy and then gave him 5 sessions of radiation (which cost RM6,000). The man told me, I want my father to live. I shook my head in despair. I told him, It is better to bring your father home quickly when he is still breathing. It would cost you a lot of money (RM 8,000 instead of RM200) if you have to bring him home in a coffin. I also told him, There is no need to fight. You cannot win. No chance. Commonsense tells me that 5 sessions of radiation is not going to cure anything! Let us be realistic and honest about this. Let us understand that all of us will have to die one day. But many say they don’t want to give up easily. They want to fight and fight until death. That is okay with me. Be a fierce fighter. Ibu do you also want to fight until you die? Or are you prepared to say, Okay, I want to live as long as I can without sufferings. When the time comes for me to go, I shall go I don’t want to put up a fight. Fighting may mean sufferings. Ibu, what is your choice? P: I want to take your herbs and shall leave everything else to God. If God says I have to go, I shall go. C: Are you prepared for that? You will not get angry at me if you cannot find a cure? P: No, our life is in God’s hand. When I came here for medical treatment, I did not understand all these. I really did not understand why the initial treatment did not cure me and the cancer came back. Now, I understand what is going on. Nobody talked to me like this before. Husband: We came to consult you. Probably God had opened a way for us. C: People often tell me that God led them to us. May be God did that, but I also need to remind everyone that to get well is also our responsibility. So again, I want you to think carefully before you make this important decision. P: I have made up my mind. I don’t want any more chemo. Take care of your diet. Those who follow our dietary advice do not die because they cannot eat this or that. After talking to a patient for 5 minutes, I would know his/her attitude. Cancer is about human being. If you want to get well you have to change — change your lifestyle, your diet, your attitude. I don’t have herbs to make you change. You have to want to change yourself. Don’t worry so much. 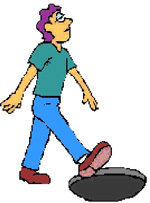 Make time for yourself and go for exercise, meditate, etc. Take the herbs. But remember, these are not magic potion. They don’t cure your cancer. So, with all of the above — clean mind, clean diet, clean body and with God’s help, I hope you body heals itself. Tell the tumour inside you, Let’s live together and let’s not give each other any problem. You don’t disturb me and I don’t disturb you. One day, when I die, you –the tumour– will also die along with me. But if you grow too much, I will die earlier and you also die with me. So let us live in peace. If you have this kind of attitude, you will have peace of mind. But if you fight with the tumour, you will suffer. Undergo all those treatments, you suffer. But at the end, you also die. So, it better that you learn how to live with your cancer. There is no further need to do any more CT scan or PET scan if you don’t want to go for medical treatment. Do all these for what? Nobody can do anything anyway. One day, if you can’t live a normal life, that means the cancer has come back. I can’t help you anymore. Go to the hospital and ask the doctor to chemo you. Accept reality — if you die, so be it. What else can we do? So, Ibu you need to understand what can happen if you take this alternative option. There is this man who had his kidney removed due to cancer. He was asked to undergo follow up chemo. He refused. He did not want to suffer. So he decided to follow our therapy. Now, he is doing fine. He is able to travel the world. He and his wife went to China. Just recently, they went to Portugal. His wife said, He followed your advice. He is happy. No problem at all. He is normal. If he went for chemo, he would surely suffer. So life is good for us. One day, when he has to die, so be it. So Ibu, I want you to decide carefully. P: I want to follow your therapy. C: Are you sure of that? And you would not blame me if things don’t turn out well? P: No, no, we will not blame you. Please help me right from today. This indeed a hard case to handle. If I have a choice, I would not want to take on this case. But I cannot betray our principle that we are here to help the “helpless and the hopeless.” I felt real sorry that SF was let down by her first oncologist. However, I need to remind everyone that not all patients who come to us benefit from our therapy. Only 30 percent would probably benefit, the rest cannot. It is all about you — your belief, your commitment and your willingness to change. In part 3 of this story, I raised the issue of money. Many people would disagree with me on this. 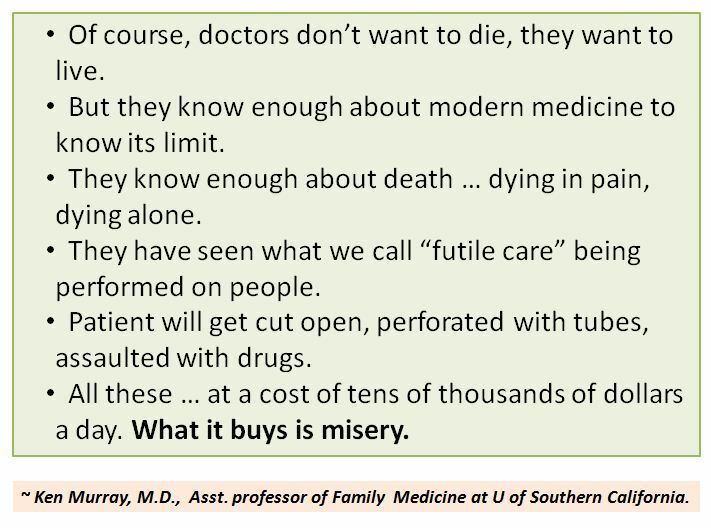 To many of us who benefit from treating those who are dying, the argument is life is valueless. Many would say, if you are going to die why let money stop you from doing what is best! One oncologist told one patient, If you don’t have any more money to pay me, ask your husband to go and rob the bank. Indeed crude. But look at this problem of money from the viewpoint of the one who has to pay the expensive medical bills. For these common people, raising money to pay the medical bills means selling the house the family is staying in. I recalled Pak Jam who came to us, looking disoriented and broken. 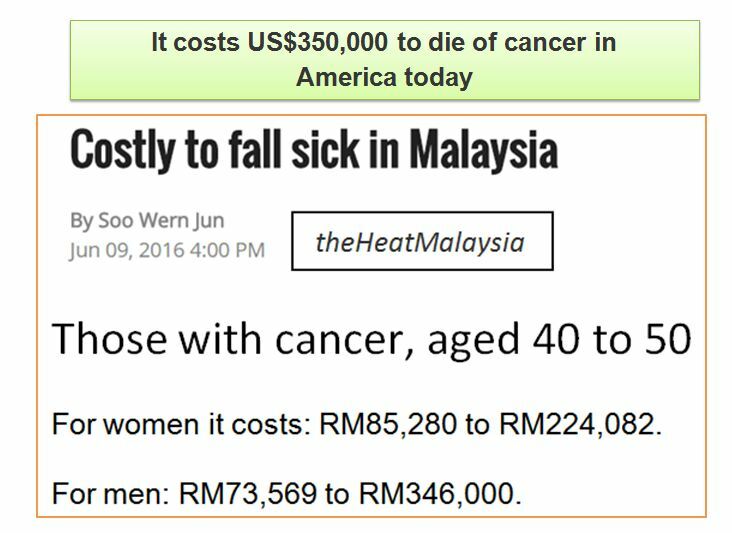 He had to spent RM2,000 per day on his wife who was undergoing chemotherapy for her leukemia in a private hospital. After 2 weeks he said all his savings were gone. He resorted to borrowing from friends and relatives. He came to seek our help because he could not afford treatment anymore. I told him to bring his wife home quickly. Don’t die in Penang. He followed my advice. His wife took the herbs and continued to life for another 3 years! She died because she went for a blood transfusion and they put in the wrong blood type into her! In this story, I appeared to be against chemo and surgery. No, I am not anti-medical treatments. But at the same time I also know through experience that these treatments can kill or do not cure cancer. This is an undeniable reality. Let me lists some of my experiences. One lady had a hysterectomy in Jakarta. The surgeon told the patient, You need to go for chemo after this. 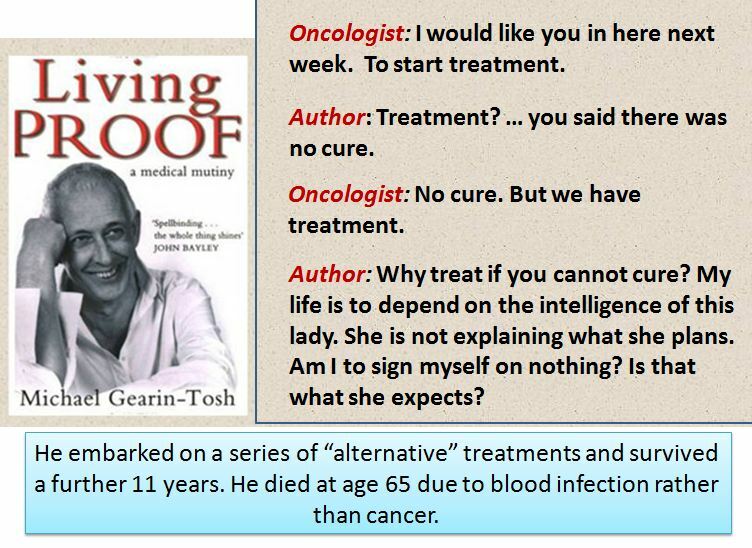 The patient asked, Can chemo cure me? The surgeon replied, I was practising in Germany for more than 30 years before I came back to Jakarta. I sent ten patients for chemo, ten patients died! As I was writing this story, one lady form Kuala Lumpur came. She had a big ovarian tumour. She consulted a surgeon in a private hospital who told her. 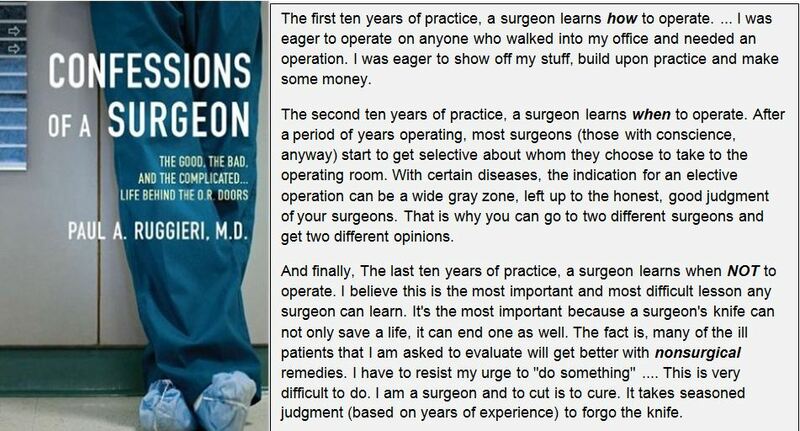 Surgery is not going to cure you. But after surgery, you need to go for chemotherapy. Chemotherapy is not going to cure you either! A lady from Surabaya was asked to go for chemotherapy for her gallbladder cancer. She refused. Why? She said, My 39-year-old son had lung cancer. He died after undergoing 5 or 6 cycles of chemo. That’s the reason why I don’t want to do chemo. CANCER ! Don’t panic ! Haste is from the Devil ~ Arab saying. Why do you visit this website? We believe you are seeking information to enable you or your loved ones to make certain decisions about his/her cancer. Our advice is: Read as much as possible. Gather information from different sources. Cast your net wider and read what others from different disciplines have to say about the same subject. Get out of the box and view your problem in a different light. Often, in the face of fear, hopelessness and panic we forget to use our commonsense. Calm down. 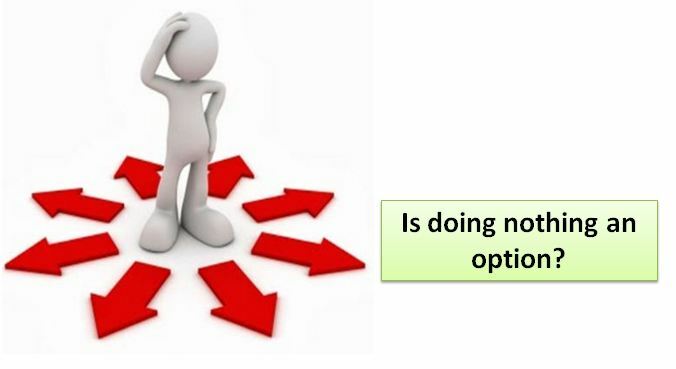 A decision made in haste or under pressure is never a good decision. Remember, you don’t get cancer just only yesterday. When we go to the hospital, we go with full faith and trust. We believe that the doctors have our best interests in their hearts – after all, medicine is a noble profession! Unfortunately medicine has morphed into something else today! The treatment of disease is not a science … but a thriving industry ~ Sir James Barr, Vice President, British Medical Association. 1. Cancer Ads Focus On Emotion, Not Facts: Are Consumers Being Misled About Treatment Options? Advertisements released by U.S. cancer centers in magazines and on TV may be delivering the wrong message. The grueling battle with cancer is one that many people undergo with little knowledge already at-hand. Popular outlets such as TV and magazines may prove unhelpful in that regard … these ads focus more on emotion than on facts. 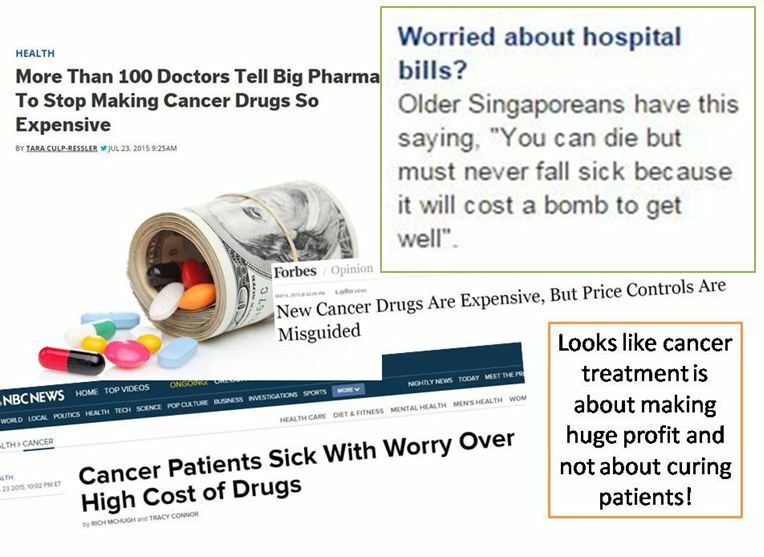 Consumers gain little information about treatment costs, risks, or even its benefits in concrete, quantitative terms. If the ads were anything to go by, the data suggests that patients would hope for survival rather than evaluate their chances. 2. Analysis Shows Advertising by Cancer Centers Frequently Evokes Hope and Fear, but Provides Little Information. Advertisements frequently promoted cancer therapy with emotional appeals that evoked hope and fear, while rarely providing information about risks, benefits, costs, or insurance availability. The researchers suggest that the ads may lead patients to pursue care that is either unnecessary or unsupported by scientific evidence. Pursuit of unnecessary tests or treatment may … expose patients to avoidable risks and contribute to increasing costs. 3. Nine of 10 cancer center ads use emotional fluff to attract patients, with little mention of success rates, risks or cost. 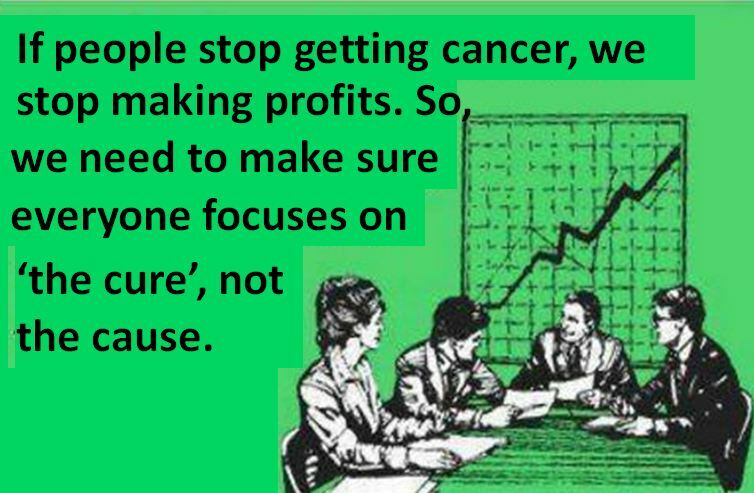 Cancer centers and hospitals are competing for your business …. Many cancer charities use the same methods to raise money, which I discuss in my most popular video. 4. Cancer Center Ads Use Emotion, Promise Cure. In their advertisements to the general public, cancer centers in the US use emotional appeals that evoke hope and fear, and rarely provide information about risks, benefits, costs … The approach may lead to unrealistic expectations and inappropriate treatments, it warns. Emotional appeals were a cornerstone of most ads …. Most stressed survival or potential for cure rather than comfort, quality of life, or patient-centered care. 5. Study: Cancer ads tug at heartstrings, leave out caveats. Advertisements for cancer centers are inflated with emotions, but fail to disclose the fine print…. d. 30% evoked fear by mentioning death, fear, or loss. Emotion-based advertisement is a powerful means of persuasion and potentially harmful to the consumer. 6. Cancer Center Advertisements Focus on Emotional Appeals. Dr. Schenker: Cancer center advertisements are increasingly common. I think it is important for clinicians and patients to be aware of the focus on survival and potential cure in these advertisements, as well as the use of emotional appeals. I would encourage patients to seek more complete and balanced sources of information – and to talk with a trusted physician – when facing important decisions about their cancer care. The above comments came about as a result of research conducted by Vater et al and published in the Annals of Internal Medicine, 27 May 2014, What Are Cancer Centers Advertising to the Public? : A Content Analysis. Advertisements promoted treatments (88%) more often than screening (18%) or supportive services (13%). Benefits of advertised therapies were described more often than risks (27% vs. 2%) but were rarely quantified (2%). Few advertisements mentioned coverage or costs (5%). Emotional appeals were frequent (85%), evoking hope for survival (61%), describing cancer treatment as a fight or battle (41%), and inducing fear (30%). In her classic essay, Illness as Metaphor, Susan Sontag suggested that the negative metaphor and myths surrounding cancer increase the suffering of patients. Vater and colleagues ….found that … benefits of advertised therapies were emphasized more often than risks, and specific data were rarely given. Appeals were largely emotional rather informational, sometimes seemed to equate treatment with cure and most often focused on survival rather than comfort or quality of life. The authors suggest that the focus may contribute to unrealistic expectations about treatment benefits among patients with cancer … and may even lead to inappropriate treatments. Almost every day I have people writing or coming to me asking for help about their cancer. 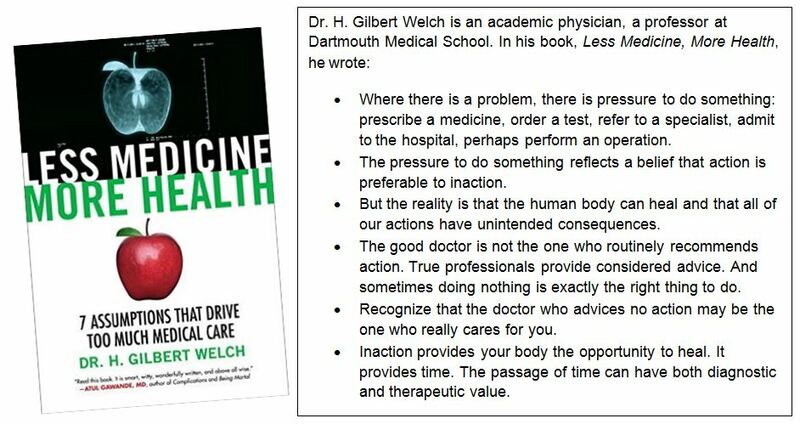 This is my advice, no matter who you go to – medical doctor or alternative practitioner. a. Can the treatment cure your cancer? b. If the answer is “Yes”, better think a million times before you take the recommended path! My experience shows there is no such thing as a cure! c. If you are told you have a 60 percent chance of success, make sure that you understand what this percentage means to you. Know that only 6 out of 10 patient succeed! Success may not mean anything! What is it, cure? Know that that this statistics may not apply to you at all. Six succeeded but how sure that you belong to the 6 and not the 4 who failed? d. Patients tell me that often they get these answers when they ask about their cancer of cure: Ask God! or We shall try and see. Such answers imply that you are in the game of luck, not science anymore. e. Another favourite answer is, No cure, but can prolong life. Ask, prolong life for how long? Some drugs only prolong life by a few days, a few weeks or a few months, rarely years! f. Even if the treatment prolongs life, it comes with a great cost in terms of side effects and money. Decide, if the extra time of being alive (but ended up being a vegetable) is worth it? g. Ask about the side effects of the treatment. Very often the “bad effects” are toned down! Some don’t want to even tell you about them! It is wise to visit the oncology ward of the hospital and see for yourself (and ask) those who have undergone the treatments. Check about treatment by reading what others say in the internet. h. Ask about the total cost of the treatment. It is foolish to proceed with the treatment half way and then found later that you don’t have to enough money to complete the journey! 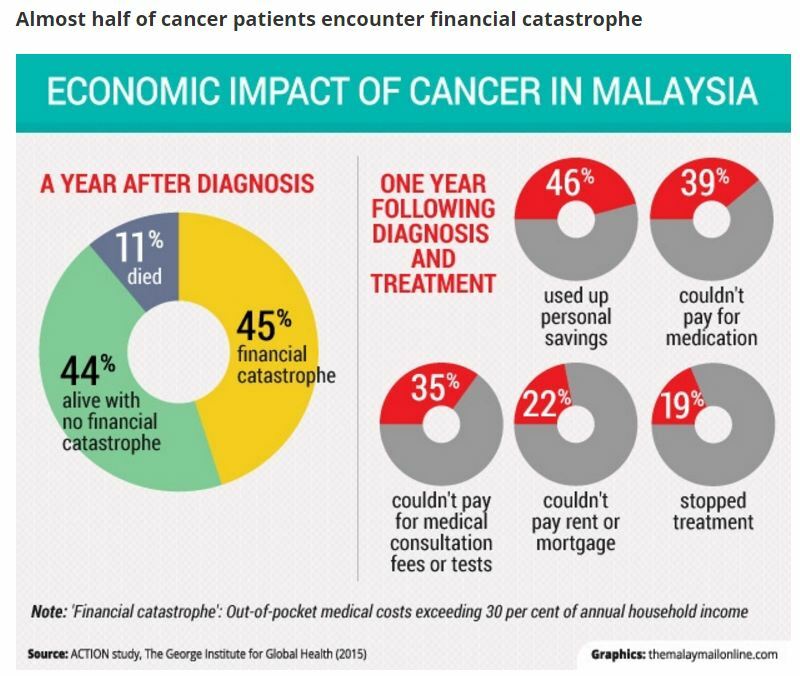 Yes, the rich and famous (and insured) do die faster when they have cancer…more from the collateral damage due to the conventional (and scientifically proven?) cancer treatments than from the original cancer itself. A classic example is the sad story of Mrs. Jacqueline Kennedy Onassis who was diagnosed with Non-Hodgkin’s Lymphoma in January 1994 and died in May 1994, just barely 5 months after diagnosis. Below is a list of 15 (there are many, many more) rich and famous personalities who have succumbed to cancer and the average period from the date of diagnosis to death is less than 2 years. How is it that the scientifically proven/tested conventional cancer treatments did not help them? Did their cancer treatments come along with excessive collateral damage to their body system or were their cancers just too aggressive? 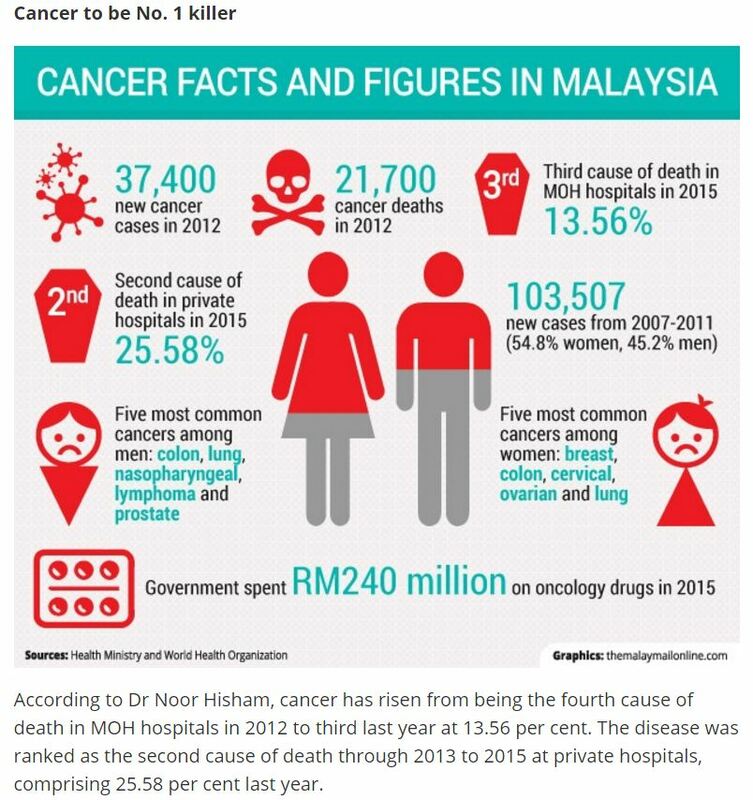 Likewise, you may remember that Malaysia’s most famous and leading oncologist, the late Dr Albert Lim, succumbed to prostate cancer on March 8th 2013 after less than a year of scientifically tested cancer treatments. He had metastasis to his pelvic area, liver and lungs as well. Was there excessive collateral damage or was the prostate cancer too aggressive?? Jo Ann was a US Republican Congresswoman for Virginia and was diagnosed with breast cancer in 2005. She underwent chemotherapy treatments and a mastectomy. In early 2007, she suffered a recurrence. When the cancer returned, she underwent chemotherapy again. Jo Ann died on Oct 6, 2007. Linda McCartney, wife of Paul McCartney died in April 1998, less than three years after it was announced that she was treated for breast cancer. Although her chemotherapy treatments had seemed to have her cancer in check, she took a turn for the worse in March 1998 when the disease spread to her liver. Heather was the wife of Darren Clarke, a PGA Golfer. She died in August 2006 after a two year battle with breast cancer that had spread to her bones and liver. She was treated at the Royal Marsden Hospital in London. Miriam, a well-known US cartoonist was diagnosed with breast cancer in 2001 at the age of 43. Three years later, the cancer had spread to her brain and she died at age 48. Elizabeth Edwards, wife of John Edwards (a US presidential candidate) was initially diagnosed with breast cancer in 2004 and was treated with a combination of chemotherapy, surgery and radiation. In March 2007, a recurrence was discovered after she cracked a rib and a subsequent X-ray showed spots on another rib, on the other side of the chest. Summary Point—From diagnosis to bone metastasis: Less than 3 years. In July 1998, King Hussein was diagnosed with non-Hodgkin’s Lymphoma (NHL) and immediately underwent chemotherapy at MAYO Clinic in US. He was treated there for six months and returned to Jordan in January 1999. In late January 1999, King Hussein returned to MAYO after his doctors found evidence that the lymphatic cancer had recurred. King Hussein underwent two bone marrow transplants with cells from his younger brother and sister (in December 1998 and January 1999). In February 1999, King Hussein returned to Jordan for palliative care and subsequently passed away on February 7, 1999. Summary Points—a) From diagnosis to recurrence: 6 months b) From diagnosis to death: 7 months. Freddy Fender, singer of hits like “Before the Next Teardrop Falls” and “Wasted Days and Wasted Nights” was diagnosed with lung cancer (two lemon-sized tumors) in January 2006. He underwent chemotherapy but later decided to stop treatment because of severe effects on his body. Following Fender’s initial round of chemo, he had a PET scan which showed that the tumors had shrunk, but also revealed that he had nine other tumors. Freddy Fender died on October 14 2006. Summary Point—From diagnosis to death: 9 months. On August 11, 2006, Suzanne Pleshette was treated for lung cancer at Cedars-Sinai Medical Centre and the hospital claimed that the cancer was the size of “a grain of sand” when it was found during a routine x-ray, that the cancer was “caught very much in time,” that she was receiving chemotherapy as an outpatient. She was later hospitalized for a pulmonary infection and developed pneumonia, causing her to be hospitalized for an extended period ……as part of her treatment, a part of her lungs was removed… Pleshette died in January 19, 2009of respiratory failure. Dan Fogelberg, a singer and songwriter, discovered he had advanced prostate cancer in 2004. He underwent hormonal therapy and achieved a partial remission but failed to completely eliminate the disease. Dan subsequently died on December 15, 2007. Pavarotti, opera singer was diagnosed with pancreatic cancer in July 2006 and required emergency surgery to remove the tumor. On September 5, 2007, Italy’s AGI news agency reported that Luciano Pavarotti’s health had deteriorated and the singer was in a “very serious condition”. He was reported to be in and out of consciousness multiple times, suffering kidney failure. He finally passed away on September 6, 2007. Dana Reeve, wife of Christopher Reeve (Superman), was diagnosed with lung cancer in August 2005 and passed away on March 6, 2006. Tony Snow, a White House spokesman, was treated for colon cancer in 2005 at which time his colon was removed and subsequently underwent six months of chemotherapy. In March 2007, doctors determined that the cancer had spread to his liver. He died in July 2008. Michael Landon was the star in the hit series “Little House on the Prairie” and “Bonanza”. On April 5, 1991 he was diagnosed with inoperable pancreatic cancer that had spread to his liver and lymph nodes. He underwent three sessions of chemotherapy but subsequently died on July 1, 1991. The Archbishop fell ill in June 9, 2006 and medical tests showed that he suffered from advanced cancer in the LARGE INTESTINE (COLON) and an unrelated malignant growth in the liver. A first operation to remove the intestinal cancer was deemed successful but later a liver transplant in the US was abandoned after discovery that the liver cancer has spread. The Archbishop passed away in January 2008. Dr Martin Abeloff, an international authority on the treatment of breast cancer and chief oncologist and director of the Sidney Kimmel Comprehensive Cancer Centre at John Hopkins University for the past 15 years, died of leukemia on September 14 2007. His leukemia, a form that is sometimes slow to grow, was diagnosed a year before that (i.e. approx September 2006). 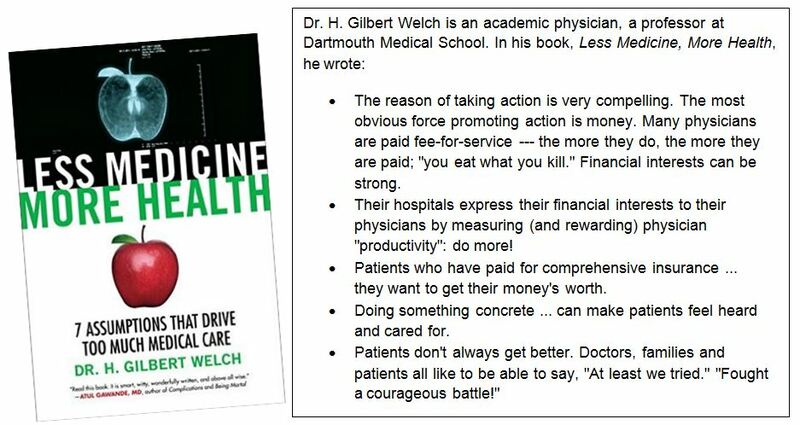 In his book, Dr Otis Brawley revealed a secret: Wealth in America (and elsewhere as well) is no protection from getting lousy care…in fact, wealth can increase your risk of getting lousy care. Do you fancy getting some collateral damage? Tom Nesi described his wife, Susan, who was 52 when she was found to have a highly malignant brain cancer. They were told that the average survival with this condition was about eleven months, but they hoped for more. For about a year, Susan had been offered numerous medications, including, in the latter stages of her illness, Iressa, which was just approved by the Food and Drug Administration despite limited data about its effectiveness. They sought care from a prestigious medical centre that offered several innovative treatments. One, called a Glidel wafer, is a dime-sized wafer that is implanted in the brain when the tumor is surgically removed. The goal was to deliver chemotherapy directly to the tumour site. The Nesis were told that this would extend Susan’s life, on average, about two months. In the ensuing months, Susan underwent 3 brain operations and 6 hospitalizations. After the third operation, she was almost totally paralysed and unable to speak or eat. In her final months, she required two weeks in a critical care center, a full time home health aide, a feeding tube and electronic monitor, home hospital equipment, occupational therapists, social workers and medication. The costs for her care were around US $ 200,000. But according to the medical profession, the experimental treatment had worked. Susan lived almost three months longer than the average patient with glioblastoma. Somewhere in some computer database, Susan’s experimental regimen will be counted a success. She was a ”responder.” And therein lies the terrible truth behind the approval of ”miracle drugs” on the basis of ”tumor shrinkage” or ”extended days.” Susan’s life was extended. But at what cost? This is a story of well-meaning doctors (?) and a desperate patient. The presumption of both parties must have been that new technology could only help. As usual, the bias was to do something, to be aggressive. In the end, the treatment may be worse than the disease itself. 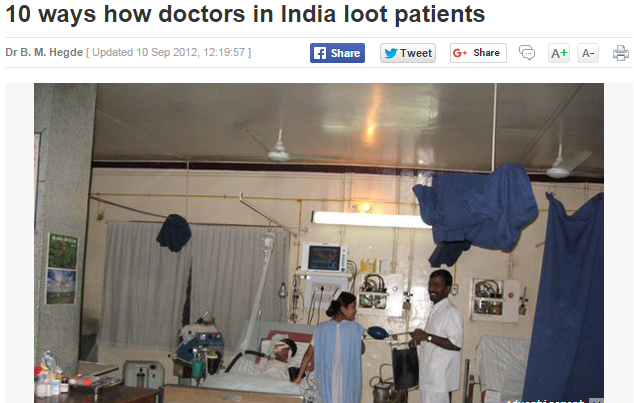 In many such cases, doctors tend to see only the good side of their interventions. They often dismiss, discount, or are wholly unaware of the downsides, which often diminish quality of life. And although new treatments often claim great benefits, we need to critically ask what the benefits are, and what we are giving up in order to have them. (Humphrey was the 38th Vice President of the USA from 1965 to 1969 and passed away in January 1978 at age 66). For those who have undergone chemotherapy treatment, please do share with the rest of the world what your thoughts are on this subject. 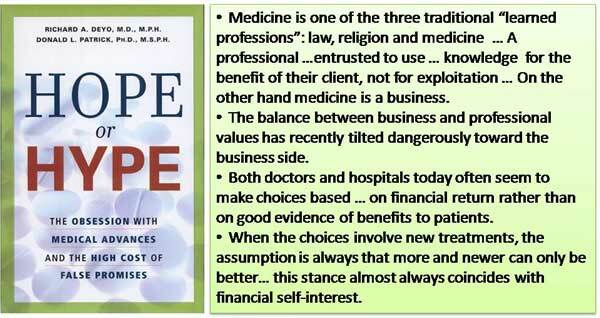 1) HOPE OR HYPE –THE OBSESSION WITH MEDICAL ADVANCES AND THE HIGH COST OF FALSE PROMISES by Dr Richard A. Deyo, MD, MPH and Dr Donald L. Patrick, PhD, MSPH. Given honest answers … about surgery, chemotherapy or radiotherapy … the chances are high that the patients will “run away” from them! YB is a 52-year old lady. About three and a half years ago she was diagnosed with breast cancer and had a mastectomy in Kuala Lumpur. It was a triple negative tumour. YB went to Singapore for follow up treatments. She received 6 cycles of chemo using FEC. Then she had 12 more cycles of chemo using Taxol and Carboplatin. No radiation was indicated. When YB started chemo, she also took our herbs and took care of her diet. The side effects she suffered was much less compared to others. She was alright after the chemo treatment. Unfortunately things did not turn out right. YB took a trip home to Kuala Lumpur (she was staying in Singapore) to visit relatives. She felt dizzy and started to vomit. Her condition deteriorated. Whenever she moved her head, she would feel dizzy or had severe headaches and would start to vomit. She had to lie down. As long as she did not move her head, she was okay. YB did a CT scan and MRI. There were tumours in her brain. YB’s daughter wrote: 11 January 2014. My mother has a relapse of her cancer to the brain. MRI shows 3 lesions in her brain. One of them is approximately 3 cm which caused swelling and subsequently dizziness, vomiting and headache. Meanwhile, she’s been given steroid to reduce the swelling. We are planning to see you right after the full report is out. CT scan result is out and it seems that the primary tumor is from the left lung. However, my mom has not suffered any symptoms or difficulties with breathing. What would you do if she was your mother and given the following details? 1. The neurosurgeon suggested surgery to remove the big tumour in her brain. According to him, the two small tumours cannot be removed surgically and YB has to undergo radiotherapy. Surgery would cost SGD6,500 and radiation cost SGD 2,000 to 3,000 (foreigner’s rate. Singapore citizen pay much less). 2. Can surgery cure her brain cancer? The surgeon said, NO, the tumour will recur. Because of that YB has to go for radiation. Whatever it is the family was told that YB will eventually die. a. If patient does nothing and is only on steroid, she has 2 months to live. b. If patient undergoes chemotherapy and radiotherapy, she has 6 to 7 months to live. c. If patient undergoes surgery, chemotherapy and radiotherapy, she has 6 to 7 months plus 3 months. According to the surgeon these are based on statistics and also on the assumption the surgery goes not well without any complications. What does the family want to do now? Everybody in the family decided to give up further medical treatment. They would rather go on herbs. Did the doctor give you such information out front? No. We have to ask questions after questions and we get answers bit by bit. Nothing is laid out neatly like the above. Bravo to patient empowerment! For you to make a decision you need honest answers. You do not get honest answers if you dare not ask! So patients, learn how to ask questions. Don’t just be satisfied with just an answer! Ask and ask, dig and dig until you are satisfied. This is because it is your life and you have to bear the consequences of that intervention not your doctors. After you get the answers, use your common sense to make your decision. Follow what your heart says. It seems very clear. 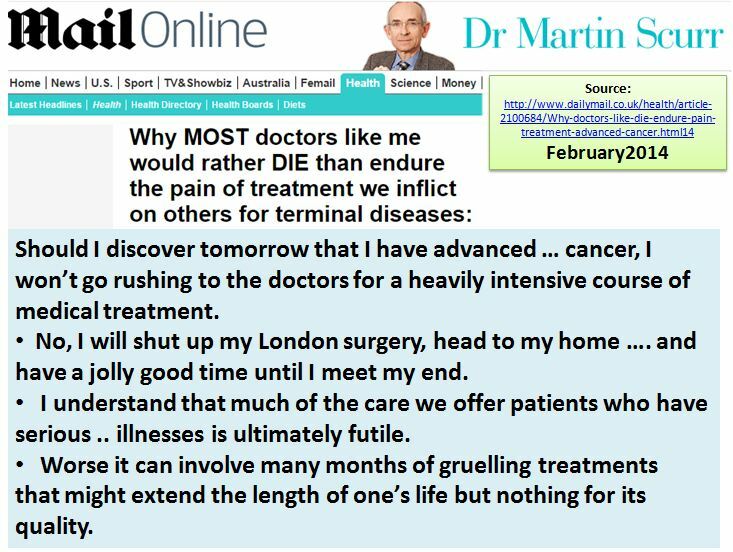 If doctors give honest answers … about surgery, chemotherapy or radiotherapy … the chances are high the patients will “run away”! 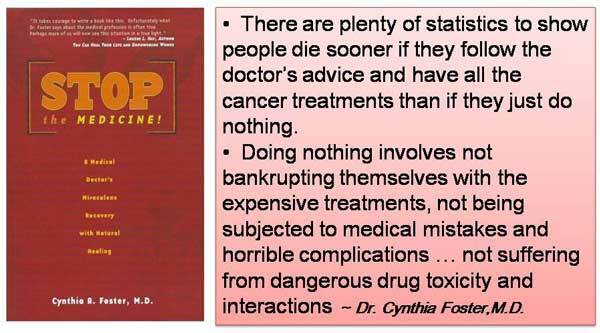 What would you do if you are told that chemotherapy spreads and makes cancer more aggressive? What would you do if you are told the following about radiotherapy? Radiation makes cancer more aggressive. Radiation reprogrammed less malignant breast cancer cells into Induced Breast Cancer Stem Cells (iBCSCs). This explains radiotherapy actually enriches the tumor population with higher levels of treatment-resistant cells. Researchers UCLA Jonsson Comprehensive Cancer Center said radiation treatment killed half of the tumor cells treated. The surviving cells are resistant to treatment and become iBCSCs. They were up to 30 times more likely to form tumors than the non-irradiated breast cancer cells. Radiation gives a the false appearance that the treatment is working, but actually increases the ratio of highly malignant to benign cells within that tumor, eventually leading to treatment-induced death of the patient. HAVE YOU HEARD OF ONCOLOGISTS DEFRAUDING CANCER PATIENTS? Cancer doctor gives needless chemo in US 35 m fraud....says prosecutors. Administered chemotherapy to patients who had other serious medical conditions that required immediate treatment before being permitted to go to the hospital. As at 2 October 2013, Dr Farid Fata is still in prison after his US $ 9 million bond has been revoked pending trial. He faces a 20 year jail sentence. · Syringes were re-used and different patients’ chemotherapy drugs were drawn from the same bag. 1) Summit doctor sentenced for cancer drug fraud. Are these the only “isolated” cases or are these just the “tip” of the iceberg? To be diagnosed with cancer is traumatizing enough…but to be cheated by your oncologist/doctor is like rubbing a ton of salt into a big wound. Don’t you think so? If you have undergone chemotherapy treatment, you may have some comments/experience to share with the rest of the world. Your comments may help to save some fellow cancer patients. 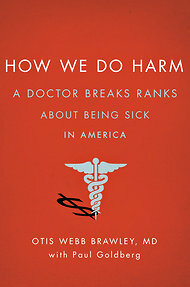 1) How We Do Harm…this book is written by oncologist Dr Otis Webb Brawley (also chief Medical and scientific officer and Executive Vice President of the American Cancer Society)…the book gives a detail description how cancer patients are mislead and defrauded into unnecessary treatments. ARE YOU SCARED? WE ARE. Allow us to share with you the sad news of the recent demise of a close relative who was diagnosed with breast in December 2011. To us, this is a classic case of a lady who did not die because of the breast cancer – she died due to the breast cancer treatments that she diligently underwent since diagnosis. This 65-year old lady was a very staunch and caring Christian and very much loved and admired by her siblings, relatives and friends. Perhaps her weak point in her journey with cancer is her unquestioning loyalty to her doctors/oncologist (her son is also a medical doctor). From Day One, she listened very faithfully to her oncologist who advised her not to consume antioxidants, herbs or other complementary treatments as these will “clash” with her chemotherapy and subsequent radiotherapy, and hence the efficacy of her conventional treatments will be compromised. Briefly, in December 2011, when she was diagnosed with a 3.8 cm lump in her left breast, she was told by an oncologist (in Singapore) that the lump is too big for surgical removal. She was then advised to have at least 8 sessions of chemotherapy “to shrink the tumour” before surgery could be performed. She followed the doctor’s advice and underwent chemotherapy during the whole of 2012 – 6 sessions of EC (Epirubicin + Cyclophosphamide) followed by 5 sessions of docetaxel, which ended in January 2013. Come January 2013, instead of the tumour shrinking, the condition of her breast became more inflamed, with a few more new lumps appearing at the sides the breast. She was then advised by her hometown oncologist to consider radiotherapy. So she came to KL for that purpose as the radiotherapy machine in her hometown was not working. Whilst in KL she consulted with two prominent breast surgeons, who advised that (as at January 2013), surgery was definitely not an option based on the condition of the breast after 11 sessions of chemotherapy. She subsequently did 33 sessions of radiotherapy from January to March 2013, with the intention of shrinking the five lumps. Again, while she was undergoing radiotherapy she was warned by her oncologist and radiologist not to take any herbs or antioxidants until everything is over. At the end of the 33 sessions she was referred back to her hometown oncologist, with a report that the cancer has metastasized to her bone. Back in her hometown, her oncologist recommended a new drug, Eribulin, which was only currently available in Singapore (as at April 2013). She flew to Singapore and bought 4 doses of the drug from an oncologist there at the cost of S$8,000 per dose. However, after three jabs, her hometown’s oncologist determined that Eribulin was not suitable for her. He subsequently recommended Cisplatin + Gemzar and she underwent four cycles of this, the last one being around mid-August, after which she was told that further chemotherapy would not work for her. She was totally devastated. However, as some form of hope for her to cling on, she was given oral Xeloda. All the while during her chemotherapy treatments in 2012, radiotherapy and further chemo in 2013, this tough lady was in pain most of the time and the pain became more and more intense in the months of April through August 2013. From April 2013 her lungs started accumulating fluids…this is usually a confirmation of metastasis to the lungs. In the month of August till her demise on Sunday, 25th August, she had to be on oxygen most of the time (in addition to morphine). She did try some herbal treatment off and on in between her chemotherapy/radiotherapy sessions in 2013. Obviously this could not help her much as by that time her body was a total wreck. Further, she only changed her diet in 2013. During 2012 she “ate anything she liked” as advised by the oncologist in Singapore and from her hometown. When I attended her wake on 27th August 2013, the first thing that her eldest son said to me was “Uncle, see – only 19 months!” Of course her oncologist and other doctors attributed this to her triple negative breast cancer which is supposed to be an aggressive form of breast cancer. Anyway, it is always about the cancer being aggressive, and never about the toxicities and ineffectiveness of the conventional cancer treatments which is always marketed and touted as evidence-based, scientifically tested, etc. Lately, we noticed a new current trend in breast cancer treatment very similar to this case –more and more patients are advised to have pre-surgery chemotherapy – to shrink the lump before surgery. We are very perplexed by this – why do you need to shrink the lump first before surgery when the breast, an “external” organ, can be wholly removed by mastectomy? We know of a lady who recently had a 5 cm lump removed by lumpectomy and is recovering well and she has refused any form of chemotherapy or radiotherapy. This trend of pre-surgery chemotherapy first is a huge business (if you catch my drift) for the medical/cancer establishment. This unfortunate lady paid RM80,000 for the EC and Docetaxel in 2012. Imagine how much the drug companies/and oncologists would make if they can persuade a million ladies to do so annually, world-wide. It is mind-boggling, and the damage to the body, and the suffering, is also mind-boggling. c) January to March 2013 – 33 sessions of radiotherapy + oral cyclosphomide. f) 25th August 2013 – passed away. Undoubtedly, she has found peace with the Lord now but you do not have to follow her timeline. Follow Olivia Newton John’s cancer journey….she was diagnosed with breast cancer in 1992, did one year of chemotherapy and complemented her treatments with good nutrition, herbs, homeopathy, acupuncture and practiced meditation and prayer….and Olivia is still very much alive today (22 years later)…..watch out for her more detailed story soon. BLOOD BOOSTING INJECTIONs (ESAs) WHILE ON CHEMO ENCOURAGE TUMOUR TO GROW! 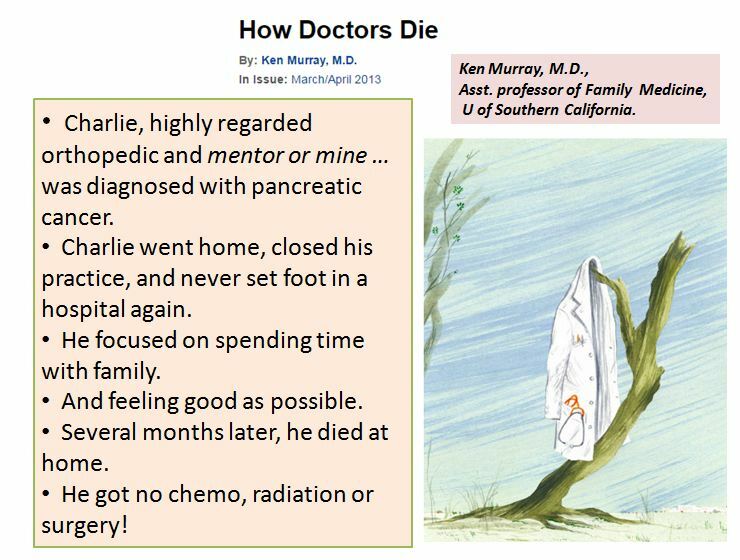 Not many MDs, least of all an oncologist, would dare to break ranks from the rules of the medical establishment and especially from the clutches of Big Pharma in the present day cancer industry. One exception is Dr Otis Webb Brawley, MD, and oncologist and the Chief Medical and Scientific Officer and Executive Vice President of the American Cancer Society. As we were reading the 2011 best seller in America “HOW WE DO HARM” by Dr Brawley, we were shocked to read in Chapters 6 and 7 that Erythropoiesis-Stimulating Agents (ESAs) causes tumour promotion i.e. the anemia-building drugs seemed to be encouraging tumors to grow. The doctor would give you ESA or a blood boosting injection if you do not enough blood after a chemo treatment. They use “the red juice” to fight anemia by stimulating red blood cell production and “the white juice” to fight neutropenia, a deficiency of white blood cells. The FDA approved the drugs for the treatment of anemia in cancer patients in 1993 based on data pooled from only 6 small studies that altogether enrolled a total of only 131 patients (page 76). The 6 minuscule trials… asked only whether Procrit (one of the ESA drugs) had the ability to prevent blood transfusion. Not a shred of data said anything about “fatigue” or its opposite “strength” (page 77). There were a lot of unanswered questions such as: was their anemia corrected? Did their underlying cancer recur? Did they die sooner? Did they face a higher risk of blood clots? (page 77). Soon after hemoglobin-drugs were approved, a German radiation therapist named Michael Henke decided to test one of the fundamental tenets of his subspecialty: that patient with higher hemoglobin levels have better responses to radiation therapy. Henke believed in the connection between hemoglobin and response to radiation. However the study’s results didn’t come out the way Henke expected. The result of Henke’s study, which was initiated in 1997, was published in 2003. The study showed that patients who received the hemoglobin-building drug didn’t live as long as those on placebo. Also, the disease progressed more rapidly in patients receiving the drug. Henke concluded that he had encountered a biological phenomenon: the drug seemed to be encouraging tumors to grow (page 81). In August 2003, researchers had to stop another study, the Breast Cancer Erythropoietin Survival Trial (BEST), when more women died on Procrit than on the control arm. In both the Henke trial and BEST trial, the survival curve showed an increased risk of death from cancer, which suggested something you don’t want to see in patients you are treating for cancer – tumour growth (page 82). In other words, pharmaceutical companies were promoting an untested therapy that was supposed to make patients feel better and stronger when, in fact, it caused stroke and heart attacks and in some cases made tumors grow (page 73). In Chapter 6, Red Juice and Chapter 7, Tumour Progression, Dr Brawley described how cancer patients are routinely “offered” hemoglobin-building drugs to even borderline anemia, a common side effect of cancer drugs. The drug companies manufactured a medical condition called “cancer fatigue” and nurses were trained to “suggest” “erythropoiesis-stimulating agents (ESA)” to all patients undergoing chemotherapy – “the red juice” to fight anemia by stimulating red blood cell production and “the white juice” to fight neutropenia, a deficiency of white blood cells. Also the disease progressed more rapidly in patients receiving the drug (page 81) i.e. the drug seemed to be encouraging tumors to grow…this compound is a stimulant, a “tumor fertilizer”. A patient with active disease is more likely to suffer tumour progression: the more tumor you have, the more tumor there is to stimulate!! (page 97). Commenting further on ESA drugs, some doctors didn’t bother to check what the patient’s hemoglobin was and erred on the side of giving the ESA every time they give chemotherapy. Doctors routinely prescribed the drugs for uses in which it had not been studied-such as anemia caused by cancer itself, as opposed to anemia caused by chemotherapy (page 78). ESAs may cause tumors to grow faster. ESAs may cause some patients to die sooner. ESAs may cause some patients to develop blood clots, and serious heart problems such as a heart attack, heart failure or stroke. Erythropoiesis-stimulating agents (ESA) are used clinically for treating cancer-related anemia [chemotherapy-induced anemia (CIA)]. Recent clinical trials have reported increased adverse events and/or reduced survival in ESA-treated cancer patients receiving chemotherapy, potentially related to EPO-induced cancer progression. Other recent meta-analyses showed that ESAs increase and worsened overall survival when given to cancer patients. · The FDA revised both the epoetin alfa and darbepoetin alfa product labels, with new “black box” warnings and expanded information on safety, tumor progression, and survival. · Additionally, the new warning states that ESAs are not indicated for patients with active malignant disease receiving neither chemotherapy nor radiotherapy. When a patient decides on chemotherapy treatment, he or she expects to be healed and not to have the cancer spread or suffer second malignancies shortly after completion of the scientifically tested and proven treatments. And to be given ESAs or G-CSFs which later promotes tumour growth isn’t it too much for the patients to bear? Is this a double bonus or a double whammy for the patients? (Please note we have not factored in the damaging side effects of radiotherapy into the above scenario). You may interpret the above quotations anyway you like and for whatever reason or circumstances you like. Let me put them in the perspective of my own work – herbal therapy for cancer. If I have patients coming to me every day and I prescribe A, B or C to them and they don’t get well. I must be a real idiot to keep on giving out the same A, B or C to them again and again hoping that one day someone get cured! To avoid being an idiot, I tell patients to stop taking our herbs if they feel that they are NOT getting any better after two or three weeks. We do not want to mislead you nor waste your precious time. I take this stance because I really believe in what Einstein said. These so-called experts are highly educated people who talk a language that you and I may not understand. They make things to appear complicated and complex (so that their expertise are always required!) Let me repeat, any intelligent fool can make things bigger, more complex and more violent. It needs a real touch of humility, courage and a lot of common sense to see things differently. In short, complex problem can just be solved simply! Unfortunately again, to many people simple answers are not impressive – too good to be true! For the past week, I spent some time surfing the net in addition to reading a book. I have shared with you what I read about the insights of Professor Paul Davies in the previous posting, Looking At Cancer Through the Eyes of a Physical Scientist, Stop thinking cancer as a disease! I don’t think we need to cure cancer. I must admit I don’t know if I am happy or I am angry after reading all these. Perhaps a mixture of both. I am happy, because I thought the experts have decided to wake up and they don’t want to be insane (as defined above) anymore. For the past many decades the cancer problem was handled by “experts” who make things more complex and violent. And the result was dismal. Then not too long ago, someone important decided that perhaps non-cancer experts could provide a better solution to the present day cancer problem. They have decided that it is time to see things from outside the box. For that, I am real glad. Why was I angry at the same time? If you hear stories day in and day out that people don’t get better because of someone else’s “insanity” you cannot help but become angry – why does the world allow or even encourage such a thing to happen? I don’t have to answer that question! Some patients know why. And to make things even worse, alternative healers who propose something “effective” but outside the norm or prevailing paradigm are labeled as quacks or snake oil peddlers. In this second posting, I ask this question: is the present day cancer treatment based on faulty and inadequate science? I don’t have to answer that question either. Here are some research papers that I came across. Bear with me if you find it difficult to understand the jargons used and the ideas beside the reports. Chemotherapy for metastatic cancer commonly fails due to evolution of drug resistance in tumor cells. We view cancer treatment as a game in which the oncologists choose a therapy and tumors ‘choose’ an adaptive strategy. Many cancers adapt to chemotherapeutic agents by upregulating membrane efflux pumps that export drugs from the cytoplasm, but this response comes at an energetic cost. Chemoresistant cells must consume excess resources to maintain resistance mechanisms. In breast cancer patients, expression of these pumps is low in tumors before therapy but increases after treatment. At the moment, the future of cancer research seems to be centered in the field of targeted chemotherapy. However, it is evident that currently neither conventional nor targeted chemotherapies will suffice against resilient tumors. Conventional therapies generally aim for maximum cell death in the shortest amount of time using fixed regimens of drugs designed to eliminate as much of the tumor mass as possible under tolerable levels of toxicity to the patient. However, our perception of cancer has begun to change. It is becoming increasingly evident that an individual’s cancer can be viewed as a Darwinian ecosystem containing a heterogeneous mixture of genetically distinct cancer cell types that compete amongst each other for space and resources. This competition, combined with conditions within the tumor micro-environment and cancer phenotypes conducive to increased DNA damage, stimulate the rapid evolution of tumor lineages. Unfortunately, this often renders current therapies ineffective against highly adaptable cancers that quickly develop resistant cell types. Adaptive Therapy, a relatively new field of cancer treatment, has the potential to counteract cancer’s ability to adapt. When intensive drug regimens are applied, the competition pressure of the chemosensitive cells is removed. This allows the resistant cells to proliferate freely, essentially dooming the patient. An adaptive approach would take advantage of this discrepancy in fitness to hold the overall population of cancer cells at a low constant, avoiding the possibility of tumors consisting entirely of resistant cells. Essentially, the ultimate goal of adaptive therapy would be to manage a tumor mass efficiently by administering drugs in a dynamic regimen tailored to each individual cancer, thereby allowing the patient to effectively outlive the cancer by managing its growth over time. A number of successful systemic therapies are available for treatment of disseminated cancers. However, tumor response is often transient, and therapy frequently fails due to emergence of resistant populations. The latter reflects the temporal and spatial heterogeneity of the tumor microenvironment as well as the evolutionary capacity of cancer phenotypes to adapt to therapeutic perturbations. Although cancers are highly dynamic systems, cancer therapy is typically administered according to a fixed, linear protocol. If resistant populations are present before administration of therapy, treatments designed to kill maximum numbers of cancer cells remove this inhibitory effect and actually promote more rapid growth of the resistant populations. We present an alternative approach in which treatment is continuously modulated to achieve a fixed tumor population. The goal of adaptive therapy is to enforce a stable tumor burden by permitting a significant population of chemosensitive cells to survive so that they, in turn, suppress proliferation of the less fit but chemoresistant subpopulations. It is a common mistake to view cancer as a single disease with a single possible cure which we have just not found yet. In reality cancer takes on many forms that share a common symptom: uncontrolled cell growth and successful invasion of cancer colonies to remote regions of the body. The key reason why we may never be able to defeat cancer may lie in the extreme heterogeneity of the population of the cells in a tumor: there is no one magic bullet. All malignant cancers… are fundamentally governed by Darwinian dynamics. The process of carcinogenesis requires genetic instability and highly selective local microenvironments, the combination of which promotes somatic evolution. These microenvironmental forces, specifically hypoxia (low oxygen conditions), acidosis and reactive oxygen species, are not only highly selective, but are also able to induce genetic instability. As a result, malignant cancers are dynamically evolving clades of cells living in distinct microhabitats that almost certainly ensure the emergence of therapy-resistant populations. Cytotoxic cancer therapies also impose intense evolutionary selection pressures on the surviving cells and thus increase the evolutionary rate. Gillies et al ( Nat Rev Cancer. 12: 487-93, 2012) in their paper Evolutionary dynamics of carcinogenesis and why targeted therapy does not work. The feeling of frustration in chasing cancer up the path only to have it resurrect out of seemingly nowhere still further upstream is a signal to me. I have sensed in this frustration a signal to think about cancer pathogenesis and treatment in new ways, like I’m sure others have. Recently I have been gratified to hear a number of researchers propose new views of what cancer is and new strategies for treating it. I have been a member of a tumor microenvironment interest group for a while, mostly to keep an ear to the ground in that area. Having spent many years trying to grow cancer cells in various ways, it is clear to me that they depend heavily on their microenvironment to survive. I noticed a few publications suggesting that resistance to chemical therapy may be mediated by more than just the response of the tumor cells. These studies suggest that the tumor microenvironment may provide protection from anti-cancer agents by secreting of growth factors from stromal cells intermingled with the tumor cells. In one study, WNT16B growth factor secretion was induced in stromal fibroblasts, which in turn protected the cancer cells from programmed cell death. Rethinking cancer therapy has been proposed by Robert Gatenby and colleagues for some time. Let me briefly summarise what these researchers said. 1. Chemotherapy for metastatic cancer commonly fails due to evolution of tumour cells to become drug resistant. 2. So going to the oncologist is like playing a game .. the oncologists choose a therapy and the tumors ‘choose’ an adaptive strategy. A famous Singapore oncologist put it in a different way – It is just like buying a lottery hoping to strike a jackpot! 3. When chemo drugs are pumped into you, the cancer cells work overtime to pump out the drugs from their cells. If no chemo drugs were applied, the pump activity was low. This activity increased after chemo treatment. Increased activity means the cells need more energy – will this not make your MORE sick? 4. The researchers said that the commonly practised maximum-dose-shoot-to-kill treatment is flawed. Oncologists have been doing this for years. And the patients are made to believe that the stronger the dosage of poison used the higher the chances of “cure.” And that practice has now been challenged! 5. Now there is a new buzz word — the future of cancer research seems to be centered in the field of targeted chemotherapy. Take note of the terminology used nowadays, Targeted Therapy! However, it is evident that currently neither conventional nor targeted chemotherapies will suffice against resilient tumors. Target therapy make a lot of money but for patients I don’t see much meaningful results. Very often, we see disappointment. Why? 6. The researchers provide the answer: tumor response is often transient, and therapy frequently fails due to emergence of resistant populations. Why are they resistant to the chemo-drugs? The latter reflects the temporal and spatial heterogeneity of the tumor microenvironment as well as the evolutionary capacity of cancer phenotypes to adapt to therapeutic perturbations. 7. Is the kill-all-cancer-cells strategy that is done today the correct approach? Not so. You don’t have to kill all the cancer cells in your body. The goal of adaptive therapy is to enforce a stable tumor burden by permitting a significant population of chemosensitive cells to survive so that they, in turn, suppress proliferation of the less fit but chemoresistant subpopulations. 8. It is a common mistake to view cancer as a single disease with a single possible cure which we have just not found yet. The key reason why we may never be able to defeat cancer may lie in the extreme heterogeneity of the population of the cells in a tumor: there is no one magic bullet. 9. The process of cancer that occurs in your body requires genetic instability and highly selective local microenvironments, the combination of which promotes somatic evolution. Hypoxia (low oxygen conditions), acidosis and reactive oxygen species … are also able to induce genetic instability. Don’t blame it all on only the genes. You don’t have to remove your two beautiful breasts trying to prevent cancer! O, poor actress? There are MORE to it than just the genes. 10. Malignant cancers are dynamically evolving … living in distinct microhabitats that almost certainly ensure the emergence of therapy-resistant populations. Cytotoxic cancer therapies also impose intense evolutionary selection pressures on the surviving cells and thus increase the evolutionary rate. 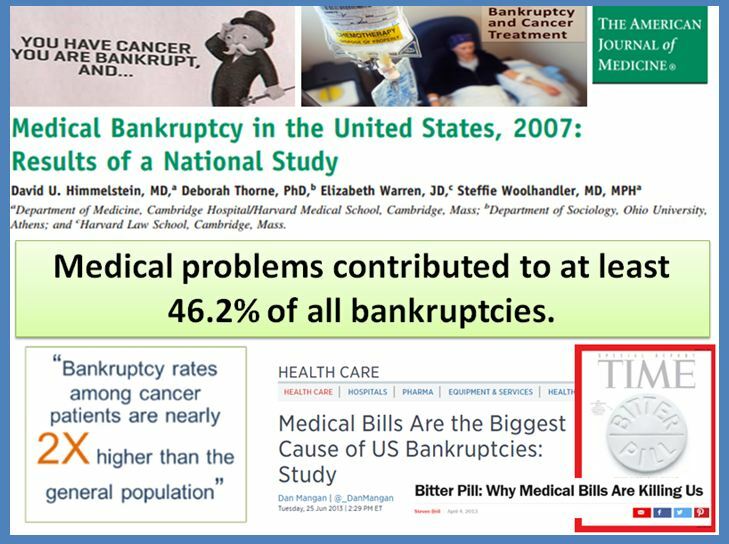 Take note, cytotoxic cancer therapies also contribute to this problem! 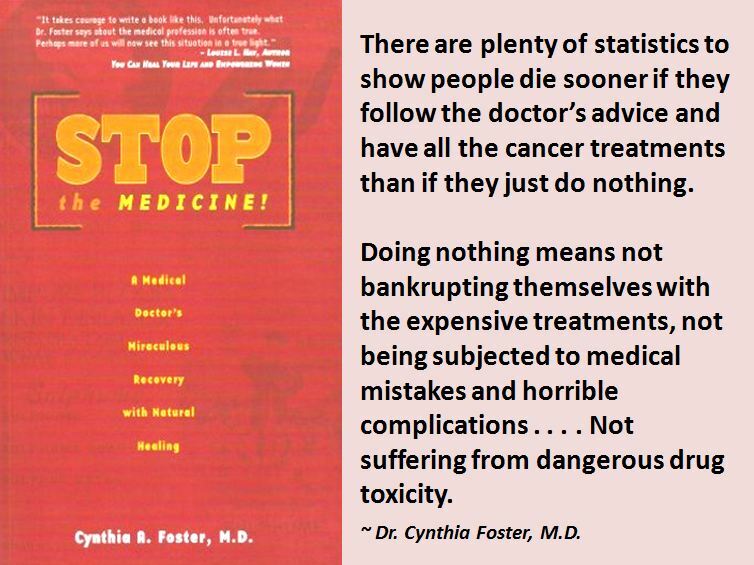 You don’t cure cancer – you make cancer – with chemotherapy! 11. At long last, someone – Eric Schuur in his blog post said: Time to Rethink Cancer Therapy? Having spent many years trying to grow cancer cells in various ways, it is clear to me that they depend heavily on their microenvironment to survive. Cancer treatment is not just about KILLING cancer cells. There is more to this! If you have appetite for more, read my next post: Quotations from: NEVER FEAR CANCER AGAIN.